We have introduced newer platforms since this post was published. Check out this user manual for Kite and Kite explainer videos here. As you must all be aware, a marketwatch is the screen where you can watch the price of stocks/commodities/F&O/currencies live. In this blog we will discuss how to setup the marketwatch on Zerodha Trader and also how to add various scrips to the marketwatch. If you are logging into Zerodha Trader for the first time, you will see what’s in the picture below. If you don’t see this you can either use the shortcut key Ctrl + G or click on Market > Marketwatch Group Settings. You can see how to create a marketwatch also. Write the group name and click add New. You will see the group in the box shown below. You can create multiple marketwatches, the picture below shows Equity and FNO marketwatches already created and Commodity in the process of getting created. Once you are done adding groups, click on Save Groups. You will be prompted to save the groups, click on Yes. Once saved, close the group settings window by clicking on the X mark. 2. To add NSE Stock/Index futures, in the first drop down choose NFO, in the third dropdown choose either FUTSTK (stock future) or FUTIDX (index future). In the fourth drop down choose the contract you want. For example, TCS Future (stock future) or Nifty Future (index future) or any other that you wish. In the seventh drop down choose which expiry (every time you get an option of 3 expiry months, choose whichever one). Click Enter. In the example below, you will see me adding a Nifty October Future contract to the marketwatch (Futidx) after already adding TCS Future (Futstk). Follow the same process but choose BFO instead of NFO, if you want to add BSE stock and index futures. 3. To add NSE stock/index options, in the first drop down choose NFO, in the third drop down choose either OPTIDX (index options, for example Nifty Options) or OPTSTK (stock options). In the fourth drop down choose the contract (Nifty, Banknifty, etc., for index and Reliance, Tatasteel, etc., for stock). In the fifth drop down choose if you want to see calls or puts (CE or PE), and in the sixth choose the expiry month. Once selected, click on Enter and your contract will appear on the marketwatch. You can see in the example below that I have already added Reliance 800 October Calls and in the process of adding Nifty 5700 October calls. In all the above cases, if you want to save the marketwatch after adding the scrips, press Ctrl + G or go to the Group Settings menu as shown in the first picture on this blog entry. Once here, click on Save Groups and all the scrips you have added will be saved. Even if you don’t do this, while logging out the system will ask you if you want to save the changes made, say ” YES” and all the scrips added will be automatically saved. STEP 4: In the example above, we created three marketwatches, Equity, NFO, and Commodity. As you would have realized, you cannot watch all three at the same time. If you want to set one of the marketwatches as a default marketwatch (lands on this as soon as you are logged in) follow this process. 1. Click on the marketwatch you want as default. 2. Once on this, right click anywhere inside the marketwatch. 3. You will get an option called Actions, click on this. 4. Under Actions you will see an option called Set as default marketwatch, click on this and it will now be set as your default marketwatch. A simpler way to do this is by using the shortcut key. Go to the marketwatch that you want as default and then press Ctrl + M. Every time you logout and login, this will be the first marketwatch you will see. STEP5: The columns that you see on your marketwatch are set by default on Zerodha Trader. This is set by us and the columns have all the mandatory required fields like Trading Symbol, % Change, etc. If you wan to add more columns or any changes that you want to make to the sequence, this is how you do it: 1. Right click on any of the column title. 2. Once you right click you will get an option called Reposition columns, click on this. 3. Once on Reposition columns, you can add or remove columns as shown in the picture below. Click on Save once you are done. You can also change the sequence on the right side box by selecting the title and moving it up or down. Now you have the marketwatch set with your favourite scrips to trade. Unable to add more than 30 scrips in overall market watches. Step3: A marketwatch is no good without any information on it. On Zerodha Trader you can have 40 different scrips per marketwatch and an unlimited number of marketwatches. Is your statement is correct. @Siva, send a request to [email protected], saying that you are not able to add more scrips than 30.. you should be able to add after that..
Click on the stock on the marketwatch and press the delete button on your keyboard. When you are closing the ZT terminal, it will ask if you should save the changes, click on yes..
i am not able to save more than 30 scrips in total..
its like.. after creating 2-3 groups.. the total scrip i can save is 30 scrips only.. Person from our support will call you on this and sort it out. Ideally it should let you add as many 30scrips marketwatch’s.. Currently the Alerts in Zerodha Trader allows you to receive SMS/Email based messages. Is this active? Also, it would be nice to have an Onscreen Alert by way of Beep/Blinking. There is an option to set sound alert on Zerodha Trader. Make sure that your computer speakers are on, you can go to set alerts and check it out.. I am facing a problem with sound alert. I had configured beep alert in the user settings for confirmation of sell and buy actions, but am not able to get any output. I have tried both the internal and external speakers. I am using nest trader 3.11.2. I have another query. I am not able to get the intraday chart in the trader. I can, however get the current chart by clicking on normal mode. But what I need is the chart for the full day i.e., from opening to the present position. Can we add indexes like Nifty or Sensex in the marketwatch window? It cannot be added onto the marketwatch window, but it can be added onto the index window which is a white box above the marketwatch. To initiate the Index window, press CTRL + I , right click in the box and choose indices dialogue box , the dialogue box shows all the indices, you can right click and add whichever applicable. sir, i cannot add mini nifty to my market watch window. i pressed ‘ctrl+s’ to add any script. in nfo section there is no scrip ”mnifty” . can we trade in ”mini nifty” future and options. how to add that. and what was the required margin for “mini nifty”. Kiran, SEBI mandated the exchanges to discontinue trading in MINI NIFTY a few months back. So presently mini nifty as a product is not allowed to be traded on NSE. I am not able to save more than 30 scrips in total even after creating 3 groups and i have approx 15 scrips in each group but get messages like subscription failed…. Please rectify this urgently. Thanks ! I guess your demat account is not yet opened, hence you can’t see NSE. Will get our account opening to call you up. and can see intraday and Historical Chart also. Again Thanks a lot for algoZ !!! We are working on this with our tech team to provide you the facility of adding nifty. Will keep you updated. i am not able to add more than 30 than scrips in total. Increased to 100. You can have multiple marketwatch open at a same time. It’s been a month since i opened the account yet i have no clue about my demat a/c… every time i call the Bangalore office they directed Me to Sandeep, and he says account is opened but all i could see is NFO and MCX… I was suppose to receive a demo which i have not.. don’t know how i could transfer the funds the account… If this is the service which you give then i need my money refunded. Was able to search your client id, will ask Sushma to call you up first thing tomorrow, surprised that she hasn’t called you for a demo. As far as demat goes, I guess there must be some document pending from your side, will get someone to follow up on this as well. I have opened an account with you. Account is opened. My ID is DR1100. I went to set the market watch but didn’t find exchange segment BSE & NSE. Now it is only showing FNO & CDS. Why I am not able to see BSE & NSE. my guess is that your demat account is still not opened and hence you are not able to add the equity segment, which can be added only with the demat details as per the new exchange regulations. Can you send an email to [email protected] asking for status. I have applied for demat+trading account. D.A. is not opened till now. We will find the status of this tomorrow and get back to you. 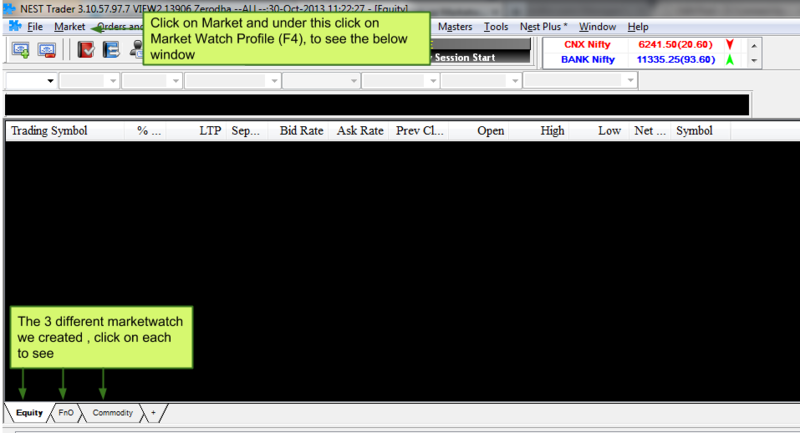 For me also, it is a similar status ….only showing FNO & CDS ….not able to see BSE & NSE. Had couriered the required docs on 26-Aug. My TA opened on 4-Sep but dmat not opened yet !?! What is the use of TA without dmat ….. The reason we open trading immediately is because 90% of our clients trade on f&O and you don’t need a demat account for this. Can you send an email with your contact details and zerodha client id to [email protected], we will work on this immediately. Demat account is not opened till now. TA opened on 14th aug.
Will have this checked immediately. If you press control + I , a white box opens up on ZT, If you right click inside this box, it gives an option for indices dialogue box, right click on indices you want to add and click add, it gets added to this Index dialogue box. 1. Is there a better help available on Zerodha on using ZT? Answers to our questions are buried deep in blogs at z-connect! 2. A demo was promised. Whom to contact for the demo of ZT? ZT looks greek to me?! We are moving towards a new format of Zconnect, should be easier for you to find answers for queries regarding trading with us. Hi, this is shameel again. 1. I got an instant call back from the sales team (Mr. Bosco) in response to an email with the above queries. 2. A little while ago, a lady from Zerodha gave demo of ZT. Which was short and sweet. 3. There was software issue on Nest Plus on ZT. The lady installed the required version of the software through remote access. 4. My account is PARTIALLY opened! Still demat a/c is not yet activated – accordingly Zerodha, it will take some more time (demat is by 3rd party). I understand the delay. BSE/NSE will be active only after demat. ID verification was done today successfully. Please look into my account login ID RA1120. I just received my account details yesterday. I am a new client. I have got only two exchanges into my market watch and that is CDS and NFO. Where are the equities, NSE, BSE? please do the needful. thanks. Anand. The reason for this would be because your trading account would have been opened, but demat would be still pending. As soon as demat is opened, you will start seeing the equity segment as well. Can you share your client id on [email protected], we are working on making the demat account opening process a lot faster, the trading account usually opens within 48 hours. I wanted to do my first trade, as soon as i hit the submit button it asked for a transaction password. How do I get it? thanks. Anand, your transaction password would’ve been sent to you at the time of account opening to your registered email ID with us. We’ve just now reset your transaction password again and sent it to your registered email ID with us. Please change your transaction password by going to the change password page. Is any update on Devenra’s request. It is really required to have nifty spot data in market watch. I also have share khan account and only for nifty spot data I need to use it. We are working on this and should have this data on the new version of our platform. How can I add live Sensex and Nifty streaming on toolbar? What is the maximum no of scripts zerodha provide for market watch? Initially i had 30 now increased to 60 on request .can i subscribe more scrips ? You can put a request for more to [email protected], it can be increased by a bit more. Nitin and Team – Starting to feel a bit frustrated that I have to follow up to enable features that my account is entitled for. Along with issues that I’m facing with AlgoZ not being enabled, additionally now I find I’m unable to add more than 30 scrips in marketwatch (all groups combined). As per your blog on Marketwatch I should be able to add 40 scrips per marketwatch, and unlimited number of market watches. Seems like many features are not enabled for me yet. Sent another email to [email protected] – have not received any reply to email sent 2 days ago. The customer service needs serious improvements. AlgoZ has been enabled, logout and log back in, even your scrip limit for marketwatch has been increased. Thanks Nithin! I got a couple of calls from Zerodha (Sushant?) and just now got off the phone with Omnesys (Sunil)… All set up and looks good now, thank you for the assistance in getting it up and running. Cheers! Only upto 30 scrips are refreshed with market data even though the marketwatch is having 144 F&O scrips. Please let me know what should be done as all the scrips need to be streamed with prices on a single marketwatch. I got the account only yesterday, so checking the software first. 1) I too had the same of “subscriptions exceeded 30” fatal error when I tried to save another marketwatch with about 20 scrips. In this we can provide as formula and the result shall be displayed. However there is some error. Only the integer value is displayed. For ex: for the formula “LTP”-“Open” and if the values are 12.5 & 10, instead of showing 2.5, the value displayed shall be 12. So what is difference and which is value I should take for normal trading with or without stop loss (mostly with stop loss). It would be nice if you provide the margin percentage of all FO scrips in a list. 1. If you want more scrips, shoot an email to [email protected], we will have it increased. 2. Will bounce it off the tech team. NRML (Normal), where you will need the entire SPAN+Exposure margin to trade. You can see this here. If you want to see this in percentages, there is a small link on the top right of the main box Equity SPAN margin. MIS (Margin INtraday square off), where you can trade intraday with 40% of the NRML margins, but note that all positions get squared off by 3.20pm. Bracket order & Cover order, in these two types of order you have to compulsorily choose a stop loss price and since you choose stop loss price and risk is limited, extra leverage is provided to you for intraday. So if you want to trade Infy as NRML margin required is 49147, as MIS (40% of this) which is around 20,000 and if you are trading using BO&CO with a stoploss of 3100 then the margin required is only 6414. I’m not able to add more than 30 scripts in market watch and every time get an error saying that subscription exceeds 30, I sent multiple mails to [email protected] to have the same rectified with the screen shot but everytime I get the same response to re-log in. Even after doing the same it still throws the same error. COuld you please assist in having the same resolved. I presume you had setup your beep alert by going to the Events tab in the Preference Settings window. If this hasn’t worked despite you ticking the checkbox which says “beep” you’ll have to call our office on 080-40402020 for assistance. If you want the full chart from opening until the current time for the day on Nest Plus, you’ll need to first zoom out (minus key) after which you’ll have to see the time on the bottom of the chart and double click on the start of day time. After double clicking, the mouse auto selects so you can drag it to the point you want. Then you can resize the chart to view the entire day’s action. To be able to add scrips, I’d suggest you use the Ctrl+G window. On that window, it’ll show you the number of scrips you already have on the bottom right side. You should be able to add at least 100 scrips for trading. Rajeev, send this as an email to [email protected] with your client ID, the limit will be increased immediately. I opened the account recently, only trading a/c as i had my demat with another client. how do i link those two? Btw, i had sent the master list with the trading a/c forms. If you had sent it while opening an account, the demat would already be mapped to your trading account. How to enable scrip bar in the ZT for adding new scrips to marjet watch ? Right now I am adding scrips by ctrl+shift+s which is a cumbersome method. i am getting error message: “Reason: No of Subscription Exceed 30” When I try to add additional scrip. Send a request to [email protected], we will have it increased. Currently while trading using MARKET WATCH via HTML, we do not have any opetion to “SQUARE” open positions. We have to put in a new SELL / BUY order to Square holding positions. In the Tab “POSITIONS” can we have a facility to directly Square the selected holding? we have this facility in your mobile application. We are getting Omnesys (the vendors for this product) to have this thing done. Can you forward the email with the DP ID to [email protected] and keep [email protected] in cc. what to do if I have answered the question wrong , while login and it says to contact the system administrator. Do I have to opt for ‘Forget password’ ? I do remember my password, I think I messed with “capslock button” while typing the answer. Is there any provision to add the complete option chain (say of NIFTY) on a clean marketwatch using either a button or shortcut key? Yes, ctrl+alt+D is the shortcut key. Add any F&O contract, click on it and then press ctrl+alt+D. I am not able to use this shortcut in current version of Zerodha Trader. I want to add more than 30 scrips in market watch RA1657. Thanks for the quick reply,that too on a Sunday. Scrip limit increased to 100. Please inform me how to add the delta,gamma,vega,theta values in the option market watch list. How to get the indices spot in the right corner(screen shot of previous version added)? Query 1: Resolved by pressing Ctrl+ i. working. it will become a satisfied and complete chart! Yes it should. Julius, we are also about to launch our new in house platform Pi which is a lot more advanced. Thank You Very Much Nithin Ji. I have tried to create market watch comprising few stocks which are traded in BSE. But in Exchange drop down menu only NSE is available. How to add BSE in the list. My guess is that you are not enabled on BSE. Can you send an email to [email protected] with your client ID. Amar, in the first dropdown choose MCX. Will have this checked immediately Gurdip. But the best way to do this is, send an email(ticket is generated automatically) or ask the support person to give you a ticket number. This way, the ticket can’t be closed until the issue is resolved. Thanks for your prompt response , Nithin Ji. Gurdip, I think one of our executives spoke to you this morning. We’ve ensured that the cheque has been deposited today and hopefully the funds will be credited to your trading account early next week. I have created 4 market watch but unable to add more than 30. Second problem is that only default market watch is showing price movement. When I am watching another market watch it is not showing any price movement. What is the solution? otherwise there is no meaning of multiple market watch. Manisha, send a request to add more scrips on marketwatch to [email protected]. They will increase your scrip limit from 30 set as default, and then you will be able to see the prices move. where can get NSE live stock price trigger alerts through SMS , free or premium service and delay not more than 5 minutes. I have tried moneycontrol alerts etc but not work out . can you suggest me any Apps or service provider ..
Zerodha Trader gives you email alerts. We aren’t really sure who provides SMS alerts. How to add space in Market watch between two stocks ? First click on the row you want the space and hit the space button pn your keyboard. Just increase the column width of the first column. You will be able to see the strike as well. I am new member of Zerodha. Y’day got my id and password. I want to trade today but unfortunately the process of creating market watch through zerodha’s UI is so cumbersome. i tried to get information through zconnect but the present UI and the one shown in zconnect are totally different. i am unable to trade .. pls help me in creating mw and how to do equity trading in zerodha. I am regular user of sharekhan. i want to do trading now in zerodha. Everything you need to know about Pi is mentioned on the posts in this section. How do I see the entire scrip of say Nifty50 or the sectoral indices or for that matter the entire scrip of stock futures or options available? I saw some american trading systems on youtube in which they have a dedicated window for options (including strategies) as well as for stock futures? It gets cumbersome first having to look at the stock futures from some website and then come onto the trading platform. Does Zerodha offer any way to watch the complete list of stock futures/options/indexes without me having to go to some external webpage?? For now on Pi, you can have only one marketwatch. I recently opened trading and dmat account with Zeroda. In PI market watch I dont see NSE or BSE. I only see NFO and CDS or CDC(dont recall now). When I login to KITE it shows that equity and commodities are not enabled. May be it will take few days to enable them? 1. I have some NRE shares purchased in primary market. They are dematted and available under Non-Pins account of ICICI-Direct. If I close my Demat account with ICICI, what will happen to those shares? 2. If I place an order to buy or sell 1000 shares with you, but you are able to execute it only in 7 lots, will the brokerage charges be 200/- or 1400/-? Will there be 7 separate contracts? 1. You have to tranfer shares to your new demat account. Without transfer account can’t be closed. 2. Brokerage will remain Rs.200, we charge on the order number and the order number doesn’t change if it gets executed in 7 different trades. If a sale is made on Friday, when will the money reach my account? Does sale in morning or afternoon make a difference? If sale is made on Monday then when will the money reach my account? Doesn’t matter when you sold them, if you sell on Friday, settlement will happen on Tuesday ie you an withdraw funds on Tuesday. If you sell on Monday, you can withdraw funds on Wednesday noon onwards. I will also have to pay annual charges for Trading and DEMAT accounts to ZERODHA? Is the AMC of 350/- to be paid 4 times (quarterly) i.e. 1400/- in one year? Yes, you’d have a total of 4 accounts. Its an Annual maintenance fee of Rs.300 which you pay only once a year. i am newbie to Zerodha Pi. Now i installed Pi. When i am tried to add Stocks in market watch, it seems Bse, Nse stocks are not listed. i can see only “CDS, NFO, MCX”. how to download the Equity stocks for the first time..
Raghu, looks like you haven’t either opened a demat account with us or mapped any existing demat of yours. Can you send an email to [email protected] for account specific queries. I have two very basic query in Zerodha Trader – which has been teasing me from quite some time. 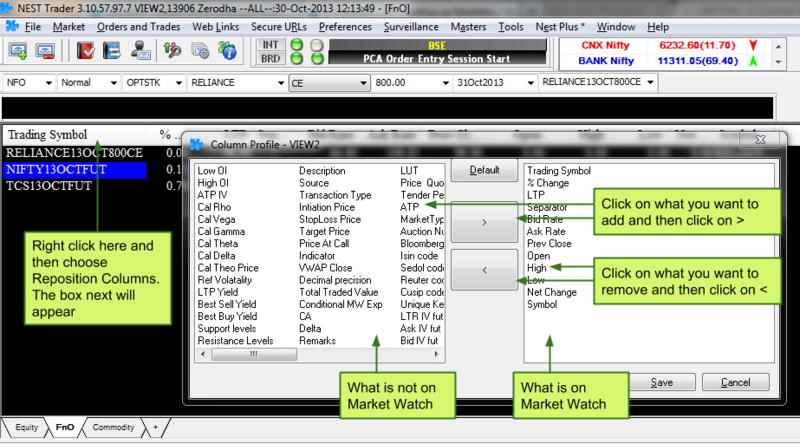 Q.1 How can i add a numbering column against the securities added in the Market watch window. What i mean is, say ” I have 30 shares in 1 market Watch window – now is there any way to show 1. Reliance, 2. Infosys, 3. Maruti and so on till 30″. If you are wondering why i would need this thing – it just allows me to track and trade quickly, saving couple of seconds every-time. 2. Is there a way, i can place an order from an excel file attached to the ZEST Trader. Or more precisely, I was told by a software developer that if i can get the API, then he can create a basic UI for placing an automatic order like “Limit if Order” types. Is it possible and can Zerodha will be able to help in it. I just need this 1 functionality of automated order if Ask bid reaches a specified limit – Again, it will save me time and improve productivity. I hope you will be able to help me with some solution. I read through the NEST manual but didn’t got anything on the above. Thanks for this wonderful forum. 1. There is no way to number the marketwatch. 2. Currently on NEST, you can create a basket order and upload this. Check this. Unfortunately no automated way of doing this. If you are looking at placing orders through your program, suggest you to go through thiss. Suggest your friend to go through the API docs, this will cost you though. Can you check this: https://www.youtube.com/user/zerodhaonline, we have some videos. I have added Greeks column in Market watch. But the problem is that the entire column of greeks is blank i.e it does not show greeks for the options in the market watch. How can i see the greeks besides the options? How can I buy two instruments simultaneously. Eg I want to buy Nifty Future and Nifty Put at the same time with a single click at market price. not able to understand the login behind the limitation on it.. Adding more scrips will end up using more system resources and bandwidth which may have an effect on the way the platform behaves. Please send an email to [email protected] with your client ID and request for increasing the scrip count to 90 and we’ll have it done. yesterday i mail on the same mail id. i got a call from an executive… she watch my pc on team viewer but she was not agree with the erroe..
tell me mr venu.. yesterday ril fut. did not trade ? yesterday icici fut did not trade ? your executives are giving silly reply.. I am using Zerodtha NEST software and i am not able to add scripts more then 30. Please resolve this issue. 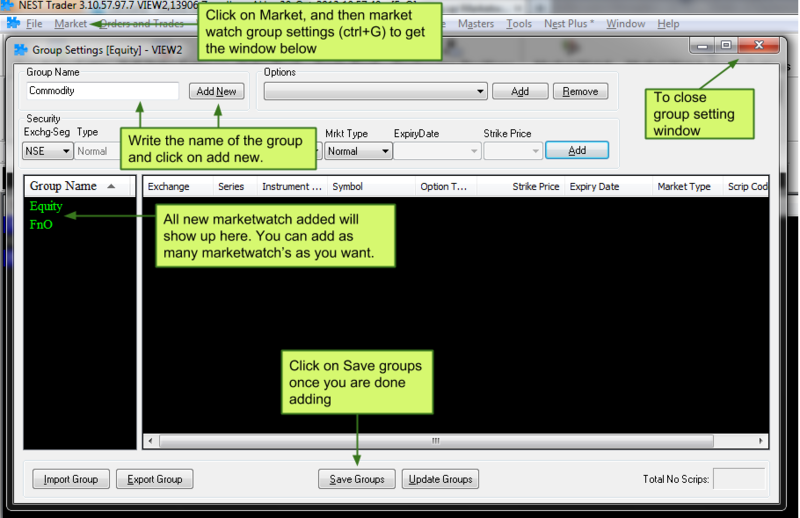 I have created 2 market watch and total scripts i added in both are about 40. only 25 out of them are updating. Requested to you to please help me. Funds are showing zero ,while ia have funds is there a problem with sofware. I am worried about my money kindly help. Surendra, between 1 am to 5 am, we run end of day process, at that time it might show 0 on the trading plaform. Check q.zerodha.com our reporting tool. DEAR SIR, I AM FACING SOME TROUBLES WHILE USING MY ZERODHA TRADER. PLEASE LET ME KNOW THE WAY TO SORTOUT MY ISSUES. 2. WHENEVER I TRIED TO MAKE CHANGES IN DISPLAY PREFERENCES LIKE COLOR, FONT SIZE,.. MY ZERODHA TRADER DOESN’T GET CHANGED AS PER MY SAVED PREFERENCES. PLEASE LET ME KNOW THE WAY TO MAKE IT. 1) Market columns will show whole numbers only in current version of nest. As you are doing (total bid/total ask), that value in most of the cases won’t exceeds 2. So, it is displayed either as 1 and 0. In next version this issue will be sorted. 2) You have to go to Preferences –> user setting –> market watch and change accordingly and apply them. Even after that they are not getting saved then please write to [email protected]. when cochin shipyard came to market debut 11-Aug-17, I could not find it in the zerodha market watch. i searched with exact key word, but i could not find.this is something intolerable. Kite is absolutely an excellent platform to trade in all segments . But i want to confirm is there any provision in Kite /PI to add stock price alerts in Derivate ( FUTURE ) segment to receive on my mobile as SMS. ?? For eg , if some stock ‘X’ crosses Price ‘100/-‘ , i need to get alerts to place order . how to add stock futures in market-watch in the latest version of pi? I am unable to add more than 30 scripts in a market watch. Please let me know how to increase this. Like in Pi, expecting 250 scripts limit under one market watch, which will help me. Hi, How to add space between scrips in the market watch NEST Trader software ? Hi, I am using zerodha nest trader. I want to know how to increase scrip limit which is 30, in market watch to 50 or more. Kindly answer the query and please do not avoid such queries, as I have observed this type of query is mostly avoided. Hey Ashok, I’m afraid this isn’t possible. I am not able to add more than 30 scrips in multiple groups. For example, I added 30 F&O stocks in group one, however, I wasn’t able to another 30 stocks in group 2. Error quoting more than 30 scrips. how to download all scrips listed in marketwatch in excel sheet. Search in Watchlist is awful. 1. Allows to add duplicate scrips. 1. Apart from global search that allows to search scrip and add to market watch list, It would be great if you can provide feature to search any scrip inline(among the list of scrips already added to watch list irrespective of page).